The Nuclear Non-Proliferation Treaty has long been key in non-proliferation and disarmament activities. The Treaty is the major international legal obstacle for states seeking nuclear weapon capabilities. In retrospect, and despite setbacks, the overall impact of the Nuclear Non-Proliferation Treaty has been significant and gratifying. Its continued success is by no means guaranteed. As old nuclear dangers persist and new ones evolve, policies to halt nuclear proliferation are more disparate than at any other time. Nuclear weapons remain an essential part of the security policies of leading states and many developmental states maintain strong nuclear weapon ambitions, while terrorists have actively been seeking nuclear capabilities. 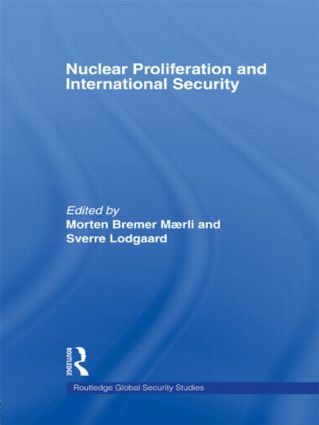 In search of an overarching strategy that recognizes both the flaws of the existing non-proliferation regime, and the value of some of the corrections proposed by regime critics, this volume assesses contemporary efforts to stem nuclear proliferation. In doing so, Nuclear Proliferation and International Security examines a number of cases with a view to recommending better non-proliferation tools and strategies. The contributors comprise renowned international scholars, who have been selected to obtain the best possible analyses of critically important issues related to international non-proliferation dynamics and the future integrity of the Non-Proliferation Treaty. Dr Sverre Lodgaard is Director at the Norwegian Institute of International Affairs. Dr Morten Bremer Mærli is Senior Researcher at the Norwegian Institute of International Affairs. Global Security Studies is a series for cutting-edge monographs and books on international security. It emphasizes cutting-edge scholarship on the forces reshaping global security and the dilemmas facing decision-makers the world over. The series stresses security issues relevant in many countries and regions, accessible to broad professional and academic audiences as well as to students, and enduring through explicit theoretical foundations.